Pitch is number of teeth per inch. Size is the diameter of the wire. We Cut Wire To Any Length You Need. Browse our selection of machines & accessories. We have it all. Secure Your Twin Loop Wire. How do I bind a document using Wire-O binding? Can I use Spiral-O Wire with my Comb Binding Machine? What should I know about Twin Loop Wire Binding? How do I choose the right Twin Loop Wire Binding Machine? How do I bind a document using Spiral-O Wire? What Pitch do I need for Wire Binding? Welcome to MyBinding video. 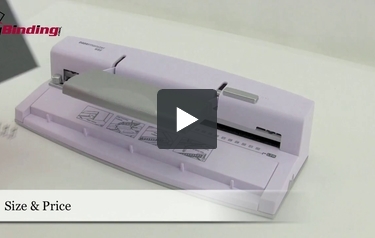 This is a video on twin loop wire binding, both the machines and the systems. Inexpensive and impressive, wire binding is very popular. The process is pretty straightforward with three different steps. First is the punching. This can be done electronically or manually. The final two steps are the binding process. First, you thread your punched project onto the wire. This can be a little tricky but you get used to it over time. The third and final step is closing the wire. This is done with a wire closer. An adjustment is made for the size wire that you're using with your project and you clamp down, the wire is closed, and your project is all finished. If done correctly, the seam of the wire is hidden between the back cover and the back page. A very common feature is side margin control. This allows all punches to be consistent and centered. Disengageable die pins is a great feature that allows you to process virtually any length sheet of paper. Depth of margin control knob allows you to select a thinner or thicker margin; thicker ones are better for thicker books. All wire closers adjust to the size wire that you're using. However, not all wire closers can accommodate the same size wire. Many wire binding machines have built-in wire closers. But there are also separate, modular units that make the process faster or more versatile. This should be taken into consideration if you have a lot of binding to do or if you have a wide range of thicknesses for your books. As with all binding systems, wire binding has a great range in size and price for machines and systems used. Some machines are very small, personal, great for the home office and low volume work, as well as extremely portable. Units like these can run under 40 dollars and upwards to about a hundred. As productivity needs increase, so do the size and options of the machines. Almost every machine is a built-in, all-in-one unit that has both punching and binding capabilities. As you move into metal machines that are more heavy duty and can handle larger projects and volume loads, the price goes up into the 100 to 400 dollar range. Another determining factor in price is the electric or manual punch. With smaller workloads, manual is no problem. But if you're going to be doing a lot of binding, the electric punch sure is helpful. As you move into larger, more heavy duty and industrial machines, you can punch a lot more a lot faster with a greater sense of accuracy, as well as the closer is able to handle and accommodate much larger books. Some of these machines are all-in-one units that do both punching and binding, but there are a few machines on the market that work with modular units. There's a base model that does the punching and the closer is a modular that you add to it, on the side for a separate operator or on top of for a single operator. These more industrial machines can run from 1,000 to 5,000 dollars. Whatever your binding needs and budget are, we have a solution. For all kinds of demos, reviews, and how-tos, check out MyBinding.com.